Optimal speed and performance Non-volatile solid state Low power consumption Write protect switch. Capacity: 2GB. Complies with SD card specification standards. Compatible with all SD card Devices. Weight: 2g. 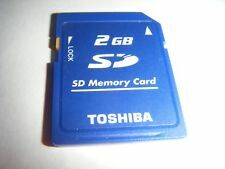 2GB SD Card. Condition is New. Shipped with USPS First Class Package. New PNY Optima 2GB Premium Flash Memory SD Card (P-SD2GB-EF) Free Shipping!!. Condition is New. Shipped with USPS First Class Package. 5 out of 5 stars - PNY Optima 2GB Premium Flash Memory SD Card (P-SD2GB-EF) Free Shipping!! 5 product ratings5 product ratings - PNY Optima 2GB Premium Flash Memory SD Card (P-SD2GB-EF) Free Shipping!! (1 piece of Transcend 2 GB SD Card. Family Line: SD. Form Factor: SD. 1 piece of protective jewel case. Product Identifiers. We will do our best to help you resolve the problem. Width 812.8 mm (32"). excluded ). These cards have never been used! What you see is what you will receive-. Large storage capacity. it is also MUCH quicker. Speed: Speed rate is Class 4. All were recognized/readable on my PC. Regulatory Approvals Optimal speed and performance Non-volatile solid state Low power consumption Write protect switch. (That cannot take SDHC hard to Find. SD card but must be able to take up to 1gb most of the 4mp are :). no storage cases. We strives to provide the best service possible. 100% GENUINE SanDisk ! You can simply keep shooting and be sure to get the picture. SanDisk Ultra II: Much More Than High Speed. (That cannot take SDHC hard to Find. SD card but must be able to take up to 1gb most of the 4mp are :). no storage cases. will be tested or check carefully before send out. Sansung 2GB SD CARD. 500MHz P6500 Probe 10x attenuation High Precision Oscilloscope Alligator Clip. Storage Capacities size: 32 mmx24mmx2. The storage temperature : 40 ℃ ~ 85 ℃. KingSpec 128GB 256GB 512GB Solid State Drive Digital Flash SSD M.2 NGFF 80mm MLC. 1 piece of SamSung 2GB SD Card. 2GB storage. USA SELLER. Fast shipping !!! Simple to use, plug and play. - Support Secure Digital Card standard interface. - Stamp size, easy to carry. - With automatic error correction (ECC) function, can automatically detect and correct errors. Lexar 32GB 64GB 128GB SD Card SDHC/XC 633x 95MB/s Class10 UHS-I U3 Professional. Storage capacity size: 32 mm x 24 mm x 2. 1 mm Read data transfer rate: 9.5 M / S, um 4.5 M / S zu schreiben. The storage temperature: 40 ℃ ~ 85 ℃. 2GB storage. 1 piece ofKington 2GB SD Card. 1 piece of Plastic Case. (.most 4mp and up can take 2gb :). that cannot take SDHC hard to find. 3 storage cases. We strives to provide the best service possible. we will work thing out ASAP when not satisfied :). 2GB TOSHIBA SD SECURE DIGITAL CLASS 4 STANDARD SD-M02G GENUINE W/CASE. Digital Camcorders. Digital Voice Recorders. Audio Players. (SD card but must be able to take up to 2gb most of the 4mp are :). that cannot take SDHC hard to find. 2 storage cases. will be tested or check carefully before send out. 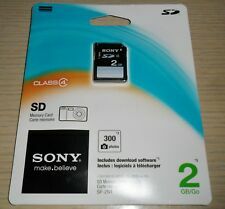 Fujifilm 2 GB SD Card Brand New Sealed Unopened. Condition is New. Shipped with USPS First Class Package. (That cannot take SDHC hard to find. SD card but must be able to take up to 1gb most of the 4mp are :). 2 storage cases. will be tested or check carefully before send out. Sansung 2GB SD CARD. Storage Capacities size: 32 mmx24mmx2. Read data transfer rate: 9.5 M/S to write 4.5 M/S. The storage temperature : 40 ℃ ~ 85 ℃. Sandisk Original, Discontinued, Limited stock! Functionally it is in perfect working condition. One of these cards is black and one is blue but they have identical labels. • Cash on pickup. EX "Excellent" Shows moderate wear. EX "Excellent Plus" Exceptionally nice. Functionally it is in perfect working condition. • Pick-Up: (FREE). EX "Excellent Plus" Exceptionally nice. May have slight wear on finish but visible only. Functionally it is in perfect working condition. EX "Excellent" Shows moderate wear. EX "Excellent Plus" Exceptionally nice. May have slight wear on finish but visible only. BGN "Bargain" Shows more than average wear. (Exactly like picture: 10pcs made in KOREA mostly. SD card but must be able to take up to 2gb most of the 4mp and up :). NO more storage case. We strives to provide the best service possible. Functionally it is in perfect working condition. EX "Excellent Plus" Exceptionally nice. May have slight wear on finish but visible only. EX "Excellent" Shows moderate wear. • Pick-Up: (FREE). Having an SD memory card is the easiest way to store and move photos from a digital camera. They tend to vary in their features and their size, and in addition to that, some of them are only compatible with certain brands. 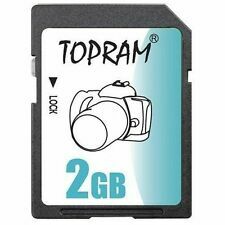 You should learn about the various attributes of 2BG SD camera memory cards to make sure that your photography can continue without the interruption of running out of storage space. 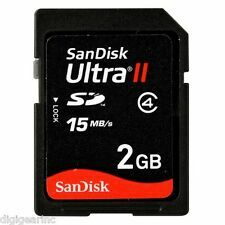 What is the purpose of a digital SD card? Updated digital cameras take quality photos in large resolutions. Although it is possible for a replacement camera to connect to another device via Bluetooth or some other method, these over-the-air connections can take a long time to transfer detailed image files. Storing the files in a lossless format onto a physical local storage unit like an SD card, and then placing the card itself into a computer or other SD reader, combines quality while still facilitating smooth transfers. How many SD cards do you need? Your need for cards depends on how many pictures you tend to take in a session, how large those pictures are, and whether you record video. Depending on your settings, a quality uncompressed image can reach 50MB or more. Video can eat up memory space quickly, especially if you are recording at a high resolution or are adding features like motion correction. For a casual user who just has a camera for birthday parties and other short events, one or two is probably enough. Someone who will have their camera all day because they are on vacation may want more than that, closer to five, just to ensure that they won't run out. A professional who takes many shots and has to save a higher proportion of them for later sorting and editing needs much more than an amateur would need to. 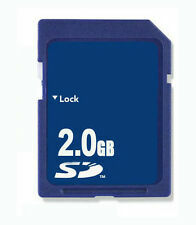 What are the features of SD storage cards? There are a few key features that you may need in an SD storage card. From a practical component, the most important one is waterproofing. Waterproofing is rated to a certain depth, typically measured in feet or meters. If you plan to take underwater photos or video, the card should be waterproof. A card marked "water-safe" or "splash-proof" is resistant to incidental water like rain, but not immersion. Other key features include high speed, which implies a faster rate of transfer to a computer's memory, and high capacity, which means more space to fill.